The MP-2986 display and keypad is a optional accessory used on the TC-36-25- RS232 or the TC-36-25-RS485 controller. 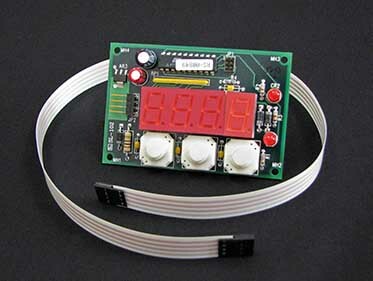 It provides a convenient way of showing and adjusting the temperature set point or showing the actual temperature being sensed when the TC-36-25-RS232/TC-36-25-RS485 is operating as a stand-alone controller. Three buttons are located on the circuit board. One toggles the display between the actual temperature and the set temperature. The other two buttons are used to adjust the set temperature up or down when the set temperature is being displayed. For a heat/cool controller with display and keypad integrated into an aluminum enclosure see the TC-720.